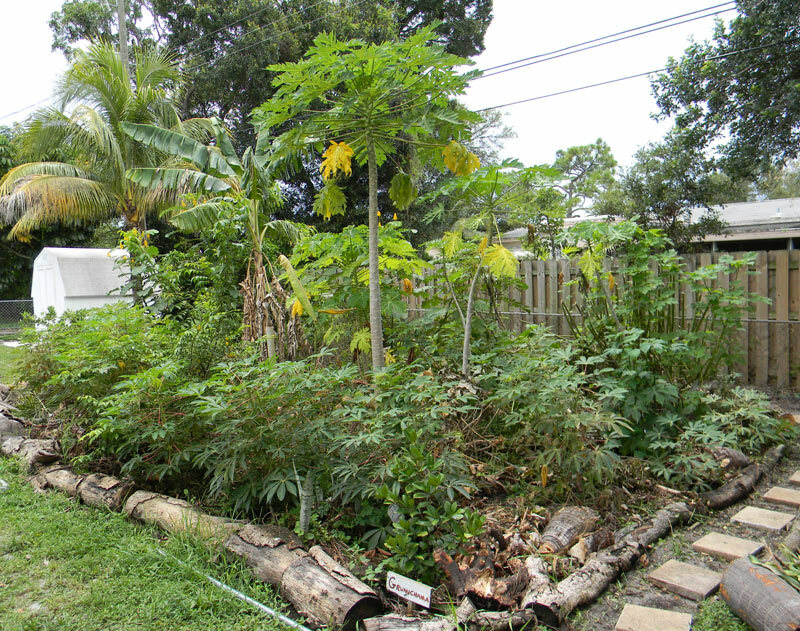 I just got back from a week-long visit to South Florida… and that means it’s time for another update on the Great South Florida Food Forest Project! The Great South Florida Food Forest Project is looking great! 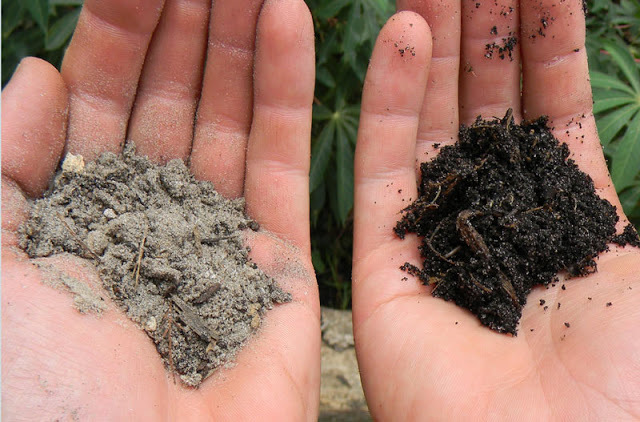 Soil in South Florida never looks like the handful on the right. Success! The sand on the left was taken from a path just outside where he’s been stacking biomass… the soil on the right is taken from just inside the log boundary at the edge of the food forest. 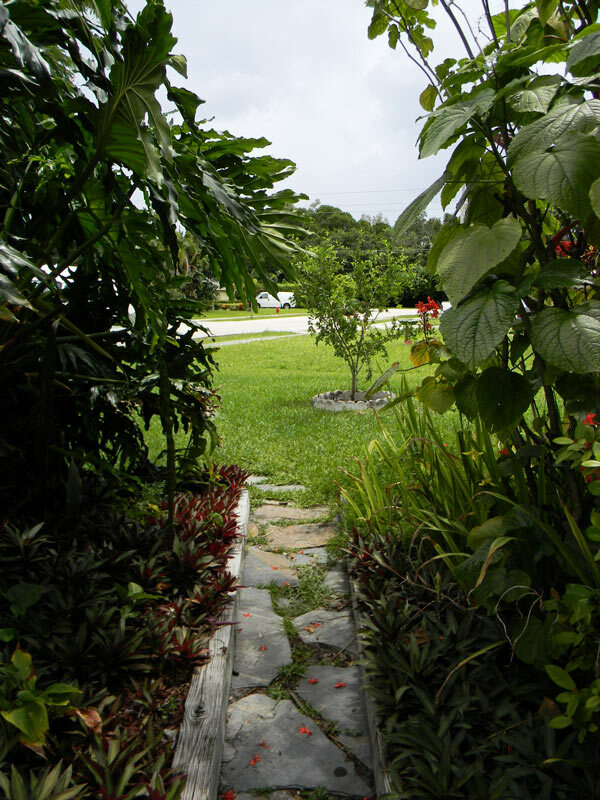 I knew deep mulching was the key to creating rich earth in the tropics but I still find this transformation amazing. It’s taken months, not years, to convert light gray sand into soil. Sure, the black area is only about an inch deep right now – but that inch of soil would’ve taken years for a forest to build. Dad fast-forwarded the process by dumping almost two feet of leaves, logs, trimmings, grass clippings and other debris from the “yard waste” trash bins up and down the street. 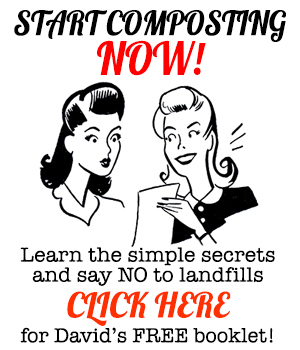 I started with a layer of cardboard, a little compost and some leaves… he’s continued by piling it on and the results are miraculous. Along the fence, at the back photo above, there’s bare dirt. That area used to contain a hedge of plumbago. Heck with that! 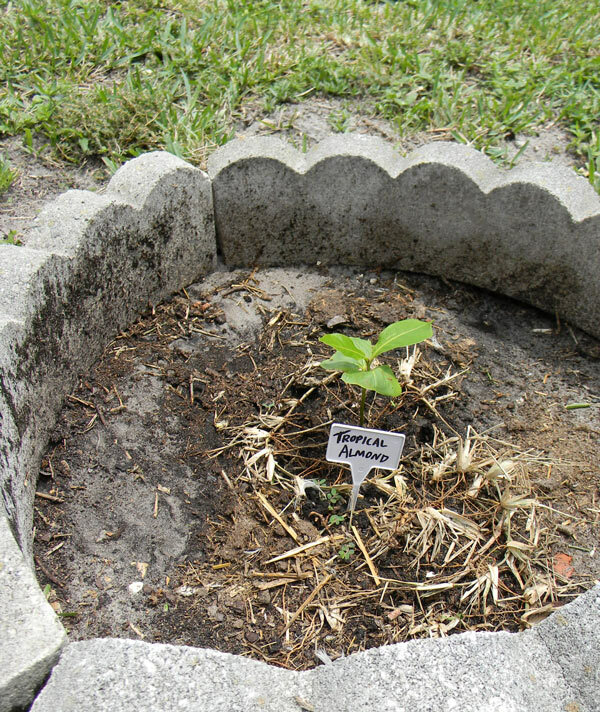 I ripped it out and planted pigeon peas instead. 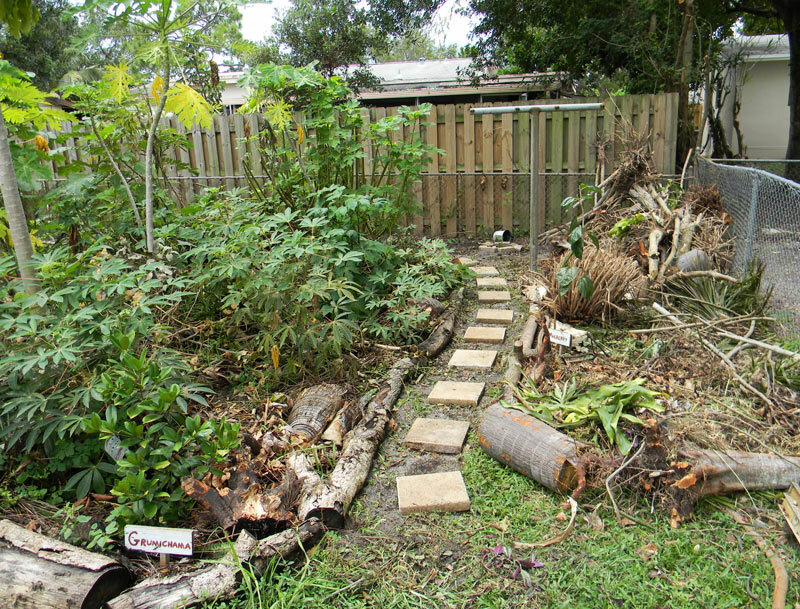 I also discovered a bunch of buried stepping stones, hence the new paths. On the left, you’ll see a clump of recently topped Tithonia diversifolia. As I’ve shared before, those are one of my favorite chop ‘n’ drop plants for Florida. And while we’re on the always entertaining topic of “trees from seed,” I did another post recently showing the dissection of a jackfruit. 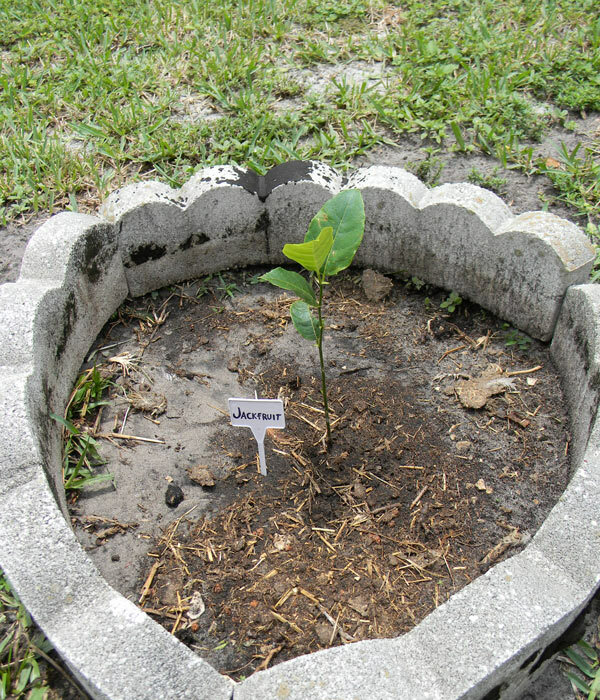 The seeds we obtained had an almost 100% germination rate… and now one of those babies is also happily residing in Ft. Lauderdale, about 15 feet from the tropical almond. I put labels on most of these trees so my family (and the visitors they take through on tours) can keep track of what we’ve planted. Not everyone is a SuperPlantGeek(TM) with a photographic memory for species. Labeling is just common courtesy, right? Dave, Have you tried feeding Tithonia diversifolia to your rabbits yet? It would be wonderful if it was rabbit fodder also. Yes! The rabbits love it and they don't seem to be suffering any ill effects. One more use. 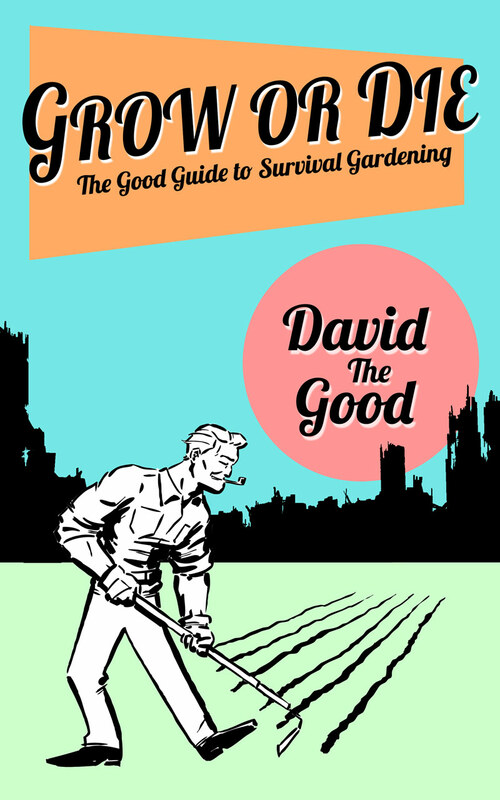 David, so the tropical almond produces edible fruit and seed not nut? Where do we obtain this? Why do you like it so well? Yes – it’s a delicious little edible on a beautiful tree. Not the most productive or practical for its space, but it is attractive. Only grows in totally tropical regions. 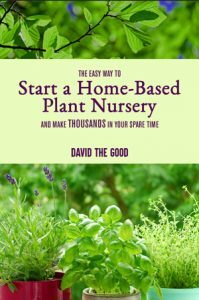 You can easily grow one from a seed that will start bearing in about two years. They’re all over the place on the southern tip of Florida.